This is of the edited TV-14 version of the film and all thoughts below should be read as such. A review of the uncut version would likely be more negative as edited versions help to address my complaints for a product…typically. It’s time to take a look at the third Terminator film! 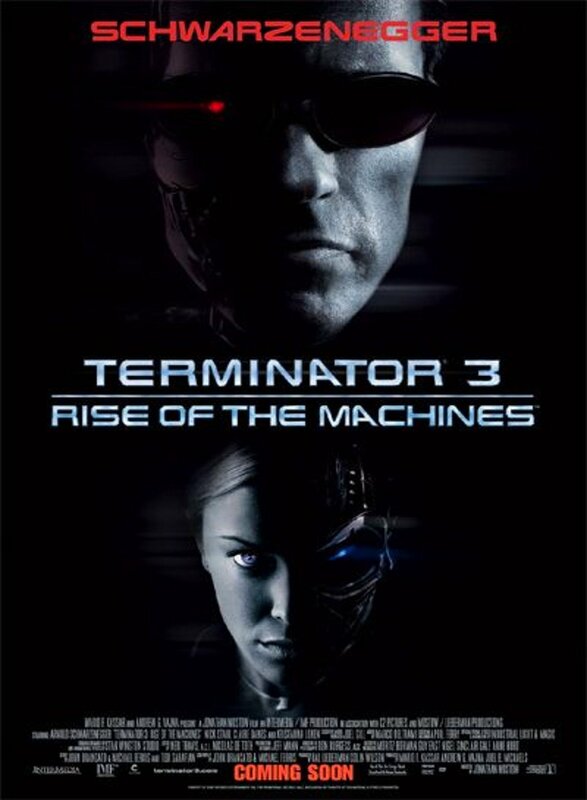 The second one was very enjoyable and really captured the feel of what a Terminator film should be like. The villain was impressive and the time travel aspects were handled well even if I had some questions on it. The third film wasn’t quite as big as the second film and certainly not as legendary, but it actually holds up to the second film. They’re very close and while I may give the second film the slight edge….it’s very close. Both of them outdo each other in various ways and I’ll compare them again towards the end of the review. Sarah Conner is gone and John must now fend for himself. The problem is that John wasn’t prepared to attack the world on his own. He has managed to scrape by somehow, but now Skynet has sent another Terminator after him. The original Terminator is around to help John against the TX, but can the older model really prove to be effective at this point? Judgment day is at hand and the humans will have to get ready for what is about to happen. Only John can save the world, but can he even save himself? As with the last film, John makes for a very poor protagonist. It’s hard to root for him when you consider the fact that one of his very first scenes is him getting locked up in a cage and swallowing some intriguing pills. He doesn’t get much better than that as his personality is simply unlikable. It’s like he was only half listening to Sarah’s warnings and he barely even seems to remember the Terminator from the second film. Granted, it’s another version of the character, but I expected more of a reaction although he clearly does remember the cyborg since he references the second film several times. I don’t know, he just didn’t feel consistent in that area and he never became likable. Kate is the main heroine and she probably gets the saddest role in the film. The TX naturally takes down her fiance so that she essentially has no choice but to hook up with the main guy. She moves on from the Fiance in about 5 minutes so I don’t think that the relationship was that serious anyway, but it still makes her look bad. She really had no reason to like John since they hadn’t seen each other in years and the Hollywood effect (As I like to call it anyway) should have just let her off the hook here. As just friends, it would have worked out a little better. Enough about the humans though. John and Kate are really the only two important ones. Kate’s father does have a role involving Skynet though and the fan favorite Dr.Peter also makes a quick guest star appearance for another fun scene. Beyond that, the Terminators really take on most of the important scenes so let’s talk about them. The classic T-800 is still a very likable character. He remembers what happened in the second film thanks to a sort of unified mind or something like that. The fight is certainly tough for the Terminator since he’s really outgunned at this point. The TX is supposed to be superior in every way so only plot hax can protect the T-800. He’s still the best character in the film, but I have to admit that the fight scenes were really stretching logic at times although I’ll go into that more in a second. If you liked The Terminator in the first two films, you’ll likely enjoy him here. He gets more than one great burn and most of his scenes have him doing something cool like “Talk to the hand!” or “You’re Terminated” There was definitely a lot of memorable material here. The TX is the first female cyborg to be shown and she makes for a merciless villain. Technically, she is easily the strongest Terminator that we have seen at this point and her weapons are very impressive. A single hit from her energy gun can destroy most Terminators and her instant regeneration is about as good as the T-1000’s. She can take over other pieces of technology and just acts more like a modern robot villain in general. She was certainly an imposing figure and made for a good enemy to the T-800. Even if she was a little overpowered to be honest. Unfortunately, this film has more plot hax than the first two by a long shot. As mentioned, the TX is supposed to be superior to the T-800 in every way and she proves that in several scenes. Yet, the T-800 is able to physically overpower her during the big showdown and he actually lands a number of hits. It’s like watching a Mario player in Super Smash fight someone who doesn’t know how to DI. The Terminator simply keeps hitting and flipping her and she doesn’t really try to fight back. Eventually, she just seems to realize that she’s in a fight and disposes of him rather quickly. Perhaps she was toying with him since the Terminators do have a little personality at times, but the film didn’t play it off that way. She also had many opportunities to destroy John, but didn’t. One example is when she was on the car that he was in. Simply firing her energy blast would easily destroy him along with the vehicle. Such a minor explosion would barely harm her after all, but instead she tried throwing some punches and got knocked off of the car. Rookie mistake TX…. While the plot hax was around, the fight scenes were still the best in the franchise. The film producers/directors must have realized that CGI is the way of the future as the battles are like watching the Man of Steel if it was made a few years ago. The characters are really landing heavy blows on each other and they even have some decent speed feats. The action scenes are certainly ahead of their time and while you won’t enjoy them if you don’t care for CGI, CGI fans like myself (Only for live action) will definitely get a kick out of the bout. The TX should have won without much of a fight, but it’s more entertaining this way I suppose. Their battle was certainly the highlight of the film. I found this film to be less violent than the second one and it feels like the series is getting a little tamer with each installment, which is always good. Of course, keep in mind that I am reviewing the edited version. The film can also still be intense at times like when the TX impales someone and drives while in that position. That scene was definitely pretty gruesome and the body count does get rather large at times. The implied violence can also get to you so naturally, you should know that you are about to watch a pretty intense film when you start this one. The soundtrack is also great and I have to say that it might even be better than the second’s. It’s very fast paced and the classic theme also shows up to increase the intensity. Most of the tracks really fit the scenes and while you won’t remember them for long, they are enjoyable while present. In the end, how does this film stack up against the second one? Well, T2 has the edge with the main protagonist as Sarah is much better than John. T2 has less plot hax in the fight scenes and it was also a lot more epic as the stakes felt more real and theatrical. T3 was really epic as well, but in a way, you could tell that it was the sequel that was meant to be more comic bookey. Not a real word, but that’s a good way to describe it. While T2 was more of a thriller, T3 felt like a comic book film with super villains fighting the main lead. Even just looking at how the Terminators teleport onto the scene. T2 had the much cooler entrance as the Cyborgs just appear while T3 has a black bubble that appears first, which looked decently interesting, but it wasn’t quite as epic. T3 easily had the best action scenes of the trilogy and I dare say that it had better one liners for Arnold although most of his lines tend to be really cool. As such, it’s a close battle and both films are neck and neck, but I’ve got to give T3 the slight edge here. It’s hard to say whether T3 will always have the lead or not as one may age better than the other, but it’ll be interesting to see. I’ve also got to give T3 props for the ending as it was fairly incredible and the kind of ending that you don’t see very often anymore. At least, not without a “Part II” or a direct sequel. While Salvation would end up rolling along, this was still an ending to a complete film and one that was fairly surprising. I was expecting more plot hax to be honest like the bomb plan actually working, but I loved every bit of the ending. It was all part of the plan and the heroes were just being led along. I’d love to see another ending like that sometimes, but it’s hard to handle correctly. We’ll just have to see if anymore films have it in them. Overall, Terminator 3 was better than I ever could have anticipated. The fights were a lot of fun and the humor was handled well. It felt like a complete film and a very interesting one that used time travel to its fullest. Skynet never gives up and the quick pacing of the film keeps the audience guessing. The pacing isn’t quite as good as T2 as it slows down sometimes, but it’s typically fast enough. If John had been a better main character, the film would have been that much better. I definitely recommend this film to Terminator fans and you may be pleasantly surprised upon watching it. I wonder if the upcoming Terminator film will manage to have a stronger Terminator than the TX. Somehow, I doubt it, but that would be interesting to see. This entry was posted in Live Action Movie Reviews, Live Action Movies, Reviews and tagged Action, Arnold Schwarzenegger, Film Review, Future, Machines, Movie Review, Review, Sci-Fi, Terminator, The Terminator, Thriller, Time Travel by dreager1. Bookmark the permalink. Will you be going to watch the latest one? Absolutely! I should have a review for Salvation to make sure that the blog is all caught up and then I plan to see Terminator Genysis right when it comes out with a quick review that night or the next day. I’m a really big fan of the franchise at this point. I find it ironic that the first film ended up being weaker for me than the other 3, but it’s a good sign in a way as the series continues to get better and better!